Well, where do we start? We’re sure you’ll agree that there is just so much to look at and love with this cute little invitation from Best day Ever! 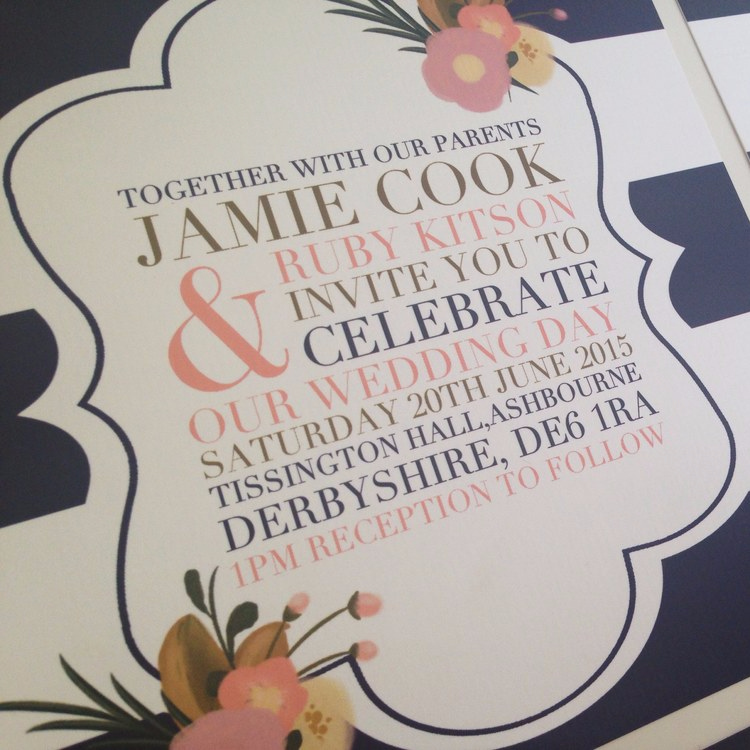 Available in a choice of colours including apple, mint, daisy and coral, you’ll have no problem introducing this design into your wedding theme for a truly delightful experience. Colour and sensational style is at the heart of this wedding invitation. If you’ve got a bold, fun personality you’ll appreciate the vibrant colours and the way they work beautifully with the sophisticated and chic layout of the Stripe Me Pretty design. We particularly like the nautical feel of the navy colour palette; perfect for beach weddings, surfers, or weddings involving naval servicemen and women! Let your imagination run wild and inject all the colours of the rainbow for a bright, upbeat wedding that everyone will remember for years to come! Printed onto luxury 300gsm A5 fine lined bright white laid stock card, your wedding day details will be held safe and sound in a pretty shape somewhat similar to that of a gilded mirror. This works well to add a vintage feel amongst the modern look of the font and its eclectic layout and sizing. The gorgeous pastel peonies finish the whole look off perfectly for a quintessential wedding feel that your guests will love! Other items in the Stripe Me Pretty collection include Save The Date and RSVP cards, table numbers and more! Everything is digitally (for precision and quality) and sustainably (because we love the planet) printed, so you can rest assured that your wedding stationary will only be of the very highest quality! Tags: Chic, Eclectic, Nautical, Navy, Peonie, Sailor.